This was my lunch yesterday; I absolutely adore salad and find it so easy to eat healthily in the summer when I can eat salad ALL THE TIME. It's so quick and easy to make, super-duper cheap, and ideal for popping in a Tupperwear box to take to work or Uni as well. Yesterday I had two slices of honey roasted ham, cucumber, cherry tomatoes, beetroot, lettuce, orange pepper, feta cheese cubes, lettuce, and a hard-boiled egg. I also added a bit of dressing made from lemon juice, olive oil and wholegrain mustard. I like to mix things up with leftover chicken or turkey, spinach and watercress instead of lettuce, various types of cheese, carrot, coriander, couscous or pasta, apple... There are so many options and it's so much nicer to have something fresh and delicious like this, than a soggy tasteless sandwich which you just know is packed with fat, sugar and salt. You can literally prepare this in the time it takes to boil an egg (about ten minutes starting with cold water, if you're unsure!). 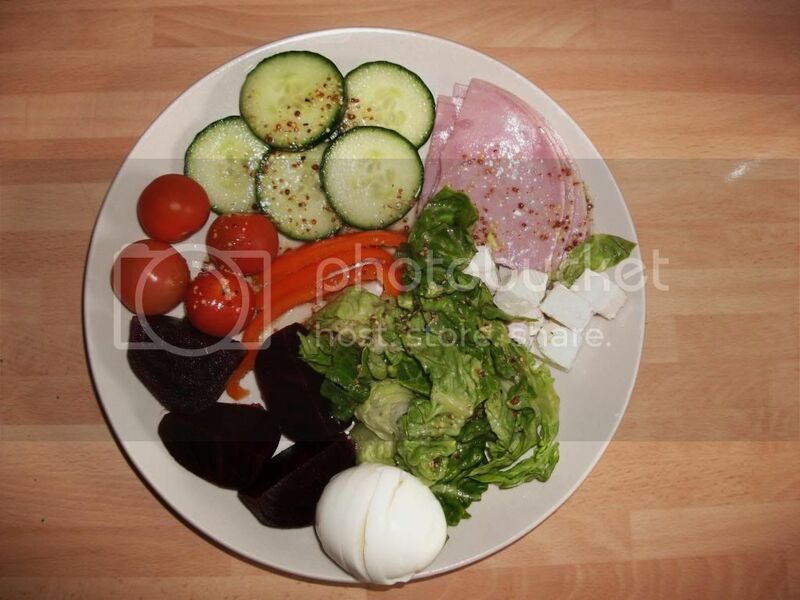 Anyone who claims they don't have time to eat healthily, or they can't afford it - SALAD. This costs about £1.40, compared to £3+ for a pre-made sandwich, you could make a whole week's worth of salad lunches for the cost of two days' sandwiches! Do you love salad? What are your favourite things to include? Do you take lunch to work, or buy it there?